Thank you for the review, it was a pleasure working for you. Rob and his guys were great, cleaned up at the end of the day and were very careful with the wife's plants. Thanks Rob. You are very welcomed, we pride ourselves in being clean and professional. Thanks for having us do the job for you. Very happy with the roof Rob did for us. It was done right, on time, and looks great. Thanks Rob. Very satisfied with work done by RobTheRoofer. They were prompt and efficient. 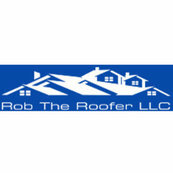 I highly recommend Rob the Roofer for roofing projects.